We’re pleased to announce a new version of the Vectorization Assistant tool: Intel® Advisor 2017 update 2. For details about download, terms and conditions, please refer to the Intel® Parallel Studio 2017 program site. 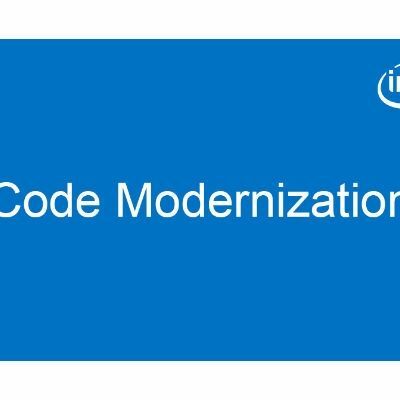 Cache-Aware Roofline, introduced as a preview in the previous update, is now an official feature of Intel® Advisor, and no longer requires setting an environment variable to access. 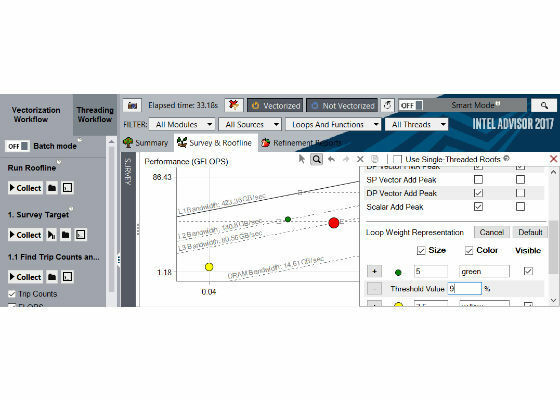 This visual performance model provides insight into the source of performance limitations and reveals how much potential performance your application is currently leaving on the table, allowing you to spend your time efficiently in optimizing where it counts most. 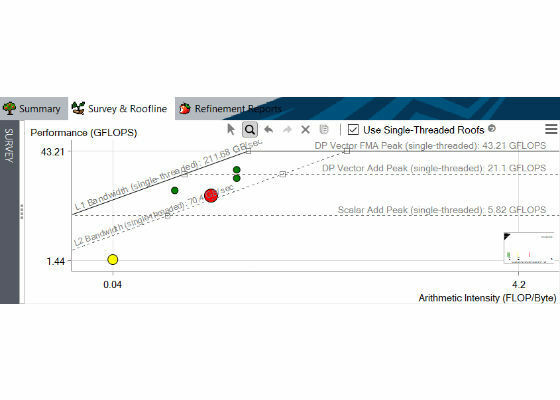 More information about the Roofline feature can be found in the Intel® Advisor Roofline main article. Roofline modeling was first proposed in a paper by Berkeley researchers in 2009. The model has been improved since then, particularly in a 2013 paper from the Technical University of Lisbon that introduced the Cache-Aware model, which is now available in Advisor as an automatically-generated chart when both Survey and Trip Counts with FLOPS have been collected. 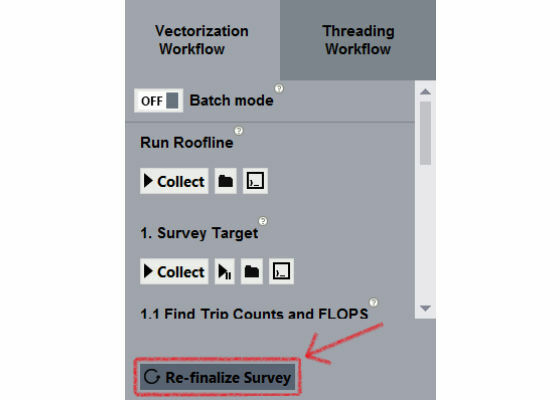 The Roofline chart and Survey report can either be viewed on their own using the toggle bar on the left to switch between them, or side by side by clicking the white ribbon with four gray dots (initially located by the toggle bar). The general quality and coverage of the Trip Counts collection has been improved. Collecting Trip Counts data also collects a new Call Count metric for functions. Trip Counts and FLOPS can now be collected independently of each other. In the GUI, there are checkboxes in the work flow. On the command line, FLOPS can be enabled by adding the -flops-and-masks option to a tripcounts collection, while Trip Counts can be disabled by adding -no-trip-counts. 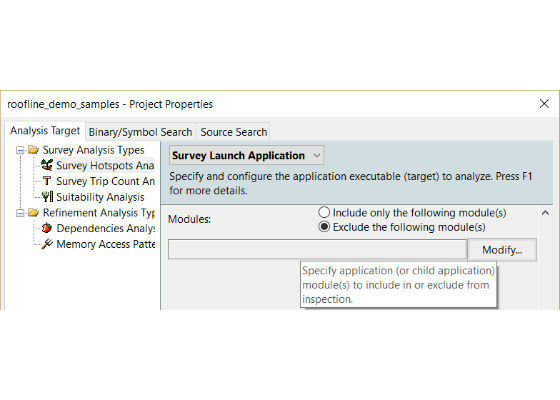 Application analysis scope can now be narrowed down before collection begins to cut out extraneous data and reduce overhead for Survey and Trip Counts analysis types, by restricting collection to specific modules. Modules can be filtered by excluding unwanted files or by restricting collection to a specific list of desired modules, using either the command line or the GUI project properties. Intel® Advisor now supports Windows* Server 2016, Fedora* 25, and Ubuntu* 16.10. All license types now have support for cross-operating system analysis. This allows for the use of a single license for both Linux* and Windows* systems, making it easier to collect data on one operating system and view it on the other. Installation packages for additional operating systems can be downloaded from the Registration Center. More information about this feature is available here. Dynamic Instruction Mixes are a new variation of the Instruction Mixes feature. While the previously-existing Static Instruction Mixes report how many instructions of a given type exist in the code, the Dynamic Instruction Mixes report how many instructions of a given type were actually executed. It should be noted that the Static Mix is counted per iteration while the Dynamic Mix is for the entire execution of the application. Dynamic Instruction Mixes are currently available only on the command line by adding the –mix option to a survey or trip counts report command, and only on a result that has had trip counts collected with the -flops-and-masks flag. Survey and Trip Counts analysis results can now be re-finalized from the GUI, allowing for easy correction or updating of binary and source search directories. This may be necessary if source files are moved after compilation, or remotely collected results are opened on a viewing machine before setting the search paths appropriately. Correcting these situations is now as simple as changing the search directories and re-finalizing. Visit the product site, where you can find videos and tutorials. Register for Intel® Parallel Studio XE 2017 to download the whole bundle, including Intel® Advisor 2017 update 2.